Purchase Clock Real Time today. Use it. Kneson Software is so sure that this product will save you time and money while cutting your payroll costs that we offer a 100%, no-questions-asked money back guarantee for a FULL 45 DAYS. 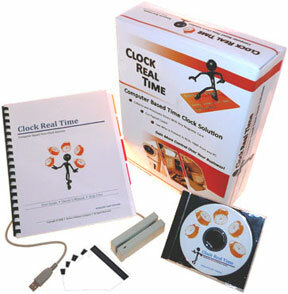 If at any time you feel that Clock Real Time does not EXCEED your expectations, we will refund you immediately. Clock Real Time Manager attendance tracking software has 13 main screens plus menu items that contain and manage employee information and clock events. Clock Real Time Scanner is a software program that reads swipe card information and registers employees arriving and leaving into the Clock Real Time system. Clock Real Time Monitor is a "roll call" window for attendance tracking that shows employees arriving and leaving in real time and from computers in multiple locations simultaneously. Card readers gather swipe information and sends it to the Clock Real Time Scanner or Manager for processing. Components let you expand the Clock Real Time system as your business grows to manage more time and attendance events from multiple locations. See Clock Real Time in action! Kneson Software products contain no malicious code of any kind. Ship to: U.S. | Outside U.S.
Used successfully in Europe for years (click here for references), Clock Real Time attendance tracking time clock software is now available in English. For a limited time you will receive the full version Manager, Monitor and Scanner software with 2 card readers and 20 blank swipe cards - a $945 value, for over 57% off if you order today. This site is connected to a secure payment server.